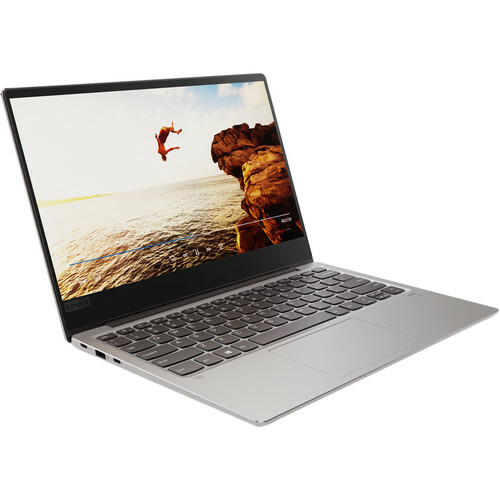 The 13.3" Ideapad 720s Notebook from Lenovo is a well-rounded system capable of handling everyday tasks such as browsing the internet, streaming TV shows and movies, and even playing games. Powered by a 1.8 GHz Intel Core i7-8550U quad-core processor and 8GB of DDR4 RAM, it can efficiently multitask and quickly access frequently used files and programs. For storing your documents, movies, and data, it has a 1TB PCIe SSD. Should you need more space, you can connect external storage solutions using its multiple USB ports. Its 13.3" display, driven by integrated Intel UHD graphics, has a UHD 4K 3840 x 2160 display capable of delivering crisp, clear content. Moreover, a dedicated GPU will allow you to play graphically demanding games. Connect to the internet via Wi-Fi 5(802.11ac) and pair compatible wireless peripherals using Bluetooth 4.1 to free up its USB ports for more important devices. Other integrated features include a Thunderbolt 3 port, a webcam, speakers, a microphone, a fingerprint reader, and a 3.5 mm combo audio jack. The operating system installed is Windows 10 Pro. The Pro version of Windows 10 includes all of the features of Windows 10 Home plus many designed specifically for business users, including Hyper-V virtualization, BitLocker disk encryption, and remote desktop access. Devices will also be able to join domains and the Azure Active Directory, and they can even access a specialized version of the Windows Store featuring custom, company-specific applications. Box Dimensions (LxWxH) 16.1 x 10.1 x 3.0"